I have spent so much time talking about insulin resistance becuase it is one of the greatest medical threats facing the world. It is estimated that approximately 33% of the adult population of the United States is insulin resistant, and if left untreated many will develop diabetes, hypertension and an array of other problems. It is an epidemic that is expected to swamp most health care systems around the world, yet sadly it may in most cases be preventable. 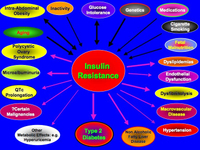 There is an enormous literature on insulin resistance. As of this afternoon there are almost 33,000 scientific papers on the subject. I created this graphic to try and summarize the key points about insulin resistance: the main factors that may cause it, as well as the most important medical consequences. This is probably not a complete list, but it gives you a very good idea of the reasons for looking for insulin resistance. Many - but not all - experts now recommend measuring insulin resistance in people at high risk of developing any of these medical problems. We have good evidence that lifestyle changes can prevent the development of many of these dire consequences, so it is certainly something worth discussing with your health care provider. I have written a great deal both on this blog and in scholarly articles, about insulin resistance and the insulin resistance and metabolic syndromes. You will have noticed that I’ve always used the term insulin resistance syndrome. This is not a matter of semantics. For years now I’ve been worried about the splitting that’s been going on in the field: we currently have six sets of definitions of the metabolic syndrome. And apart from the fun of going to all those conferences in exotic parts of the world, you have to ask what’s been achieved by these ever more divisive attempts to “define” the medical consequences of insulin resistance. The American Diabetes Association has begun to promote the concept of “cardiometabolic risk.” The Association has established a national Cardiometabolic Risk Initiative (CMRI) to stress the association between diabetes, heart disease and stroke. The idea of introducing this umbrella term is to help people better understand and manage all diabetes and cardiovascular risk factors, and to side-step some of the controversy surrounding the definition of insulin resistance or metabolic syndrome and which cluster of variables are in and out. A new Cardiometabolic Risk (CMR) Calculator to help us evaluate an individual’s risk of diabetes or vascular disease should be available by the end of the year. Part of the reason for this new initiative is the discovery that pre-diabetes, or impaired fasting glucose, where plasma glucose levels are 100-125 mg/dl, is associated with a high prevalence of cardiovascular disease risk factors such as obesity, hypertension and dyslipidemias. The person who first proposed the insulin resistance syndrome, a.k.a. syndrome X, a.k.a. metabolic syndrome, is Gerald Reaven who first recognized the syndrome in a landmark paper in 1988. He recently gave a lecture entitled; “Insulin Resistance Versus Metabolic Syndrome: Different Names, Different Concepts, Different Goals.” I am in complete agreement with his basic proposition, which is that insulin resistance explains the clustering of all of the components that make up the metabolic syndrome. So Gerry’s position is that there’s no point in trying to make a diagnosis of metabolic syndrome: everything is due to insulin resistance. So instead of wasting time and resources in trying to diagnose metabolic syndrome, it is much better to understand the pathophysiology: what is going on at the molecular level, how these processes produce risk factors, and whether we can predict others. We should identify and treat each of the underlying processes and the complications of insulin resistance. If we are going to have a syndrome, it should be called insulin resistance syndrome. And let’s stop these academic debates and get on with the job at hand: there is a 600% variation in peoples’ ability to have insulin transport glucose into cells. More than half the US population is destined to develop at least some degree of insulin resistance, so we need to look for better ways to identify people who have it, and to apply the principles of integrated medicine to keeping them healthy.